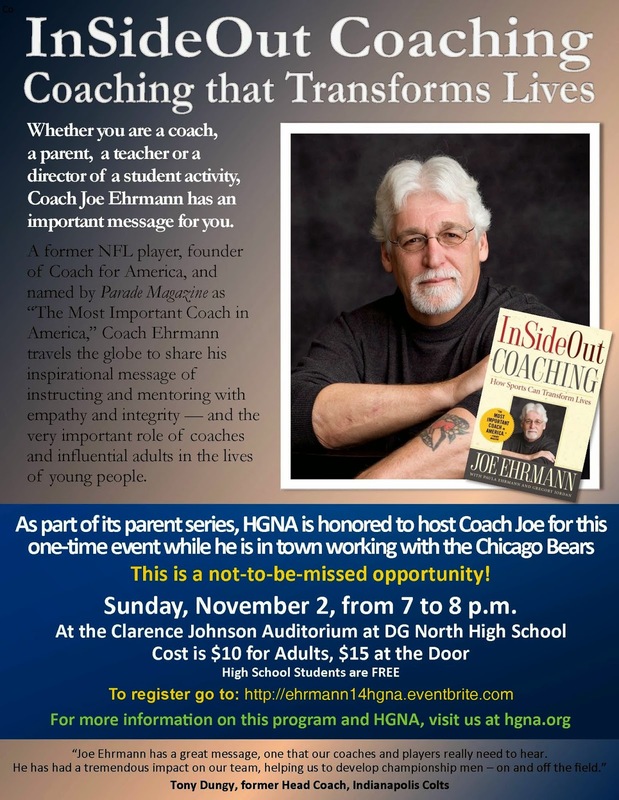 HGNA is hosting Joe Ehrmann, a former NFL player and author, this Sunday from 7-8 p.m. at Downers Grove North. The presentation will be a very inspirational message for anyone who works with youth (especially coaches) – to ensure we are building people for the future and not just focusing on the win. As a part of its parenting series, HGNA is honored to host Coach Joe Ehrmann for this one-time event while he is in town working with the Chicago Bears! Whether you are a coach, parent, teacher or director of a student activity, Coach Joe Ehrmann has an important message for you. A former NFL player, founder of Coach for America, and named by Parade Magazine as "The Most Important Coach in America," Coach Ehrmann travels the globe to share his inspirational message of instructing and mentoring with empathy and integrity -- and the very important role of coaches and influential adults in the lives of young people. REGISTRATION NOTE: High school students are FREE. Send an email to info@hgna.org with student's name to reserve a seat. Student ID required.